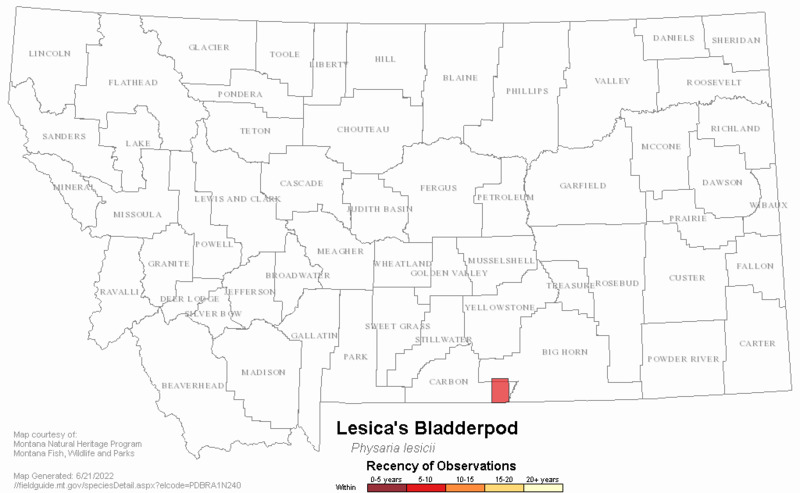 Lesica's bladderpod occurs only in Montana, where it is restricted to a few areas of limestone outcrops in the eastern Pryor Mountains. All known populations are on federal lands. While it occurs largely on steep terrain that is relatively inaccessible to humans, trampling and terracing through its habitat by wild horses may be negatively impacting the plant. Score 11 to 13 total points scored out of a possible 16 (Rarity factors and threats only). Lesica's Bladderpod is a short-lived perennial with a few, unbranched, prostrate to ascending stems that arise from an unbranched rootcrown and taproot. The basal leaves have petioles that are 1-3 cm long and spade-shaped blades that are shorter than the petiole with entire margins. The alternate stem leaves are much smaller, broadly lance-shaped, and without petioles. The foliage is sparsely covered with sessile, star-shaped hairs. Yellow, stalked flowers are borne at the tops of the stems in a narrow inflorescence that elongates as the fruit matures. Each flower has 4 separate petals, 4 separate sepals, and 4 long and 2 short stamens. The globose capsules, or siliques, have a short style on top and are borne on reflexed stalks. Flowering occurs in late June. Lesquerella alpina differs in having fruits that are more ellipsoid and are borne on bent but ascending stalks. L. alpina has leaves that are more strap-shaped and have indistinct stalks. Lesquerella ludoviciana has globose fruits on recurved stalks very much like L. lesicii; however, the leaves are narrowly lanceolate, and the fruits have a style greater than 2 mm long. Endemic to the Pryor Mountains, Carbon County, Montana (Rollins 1995). The species occurs in two distinct vegetation types. One is woodlands with a sparse overstory of Rocky Mountain juniper and/or mountain mahogany, and widely scattered Douglas-fir. The shrub layer may have scattered Symphoricarpos oreophilus, Artemisia nova or A. tridentata. These woodlands are typically found on moderate to steep, usually warm slopes at the lower elevation limits of Douglas fir (5300-6300 feet). The second habitat for Lesica's bladderpod is in bluebunch wheatgrass-cushion plant fellfields, with the dominant graminoids Agropyron spicatum, Poa secunda and Koeleria cristata. Low forbs usually dominate these habitats, which are usually on open, south-facing, gentle slopes of exposed ridge crests surrounded by forests of Pseudotsuga menziesii and Pinus flexilis. Soils are typically derived from Madison limestone and are sandy and/or shallow with a high proportion of coarse fragments. The microhabitats of L. lesicii have a high proportion (50-80%) of bare ground (Lesica 1995). Lesquerella lesicii may grow in partial shade, but is generally in full sun. Both frost heaving and wind exposure may limit the establishment of dense vegetation in this species' habitat, and steep slopes at some sites may promote moderate disturbance from soil movement (Lesica 1995). The sparse nature of the vegetation in this species' habitat suggests that it is a poor competitor. It appears that the bladderpod is facilitated by larger plants under the stressful conditions of the lower, hotter slopes, where it has been observed growing primarily beneath shrubs of Cercocarpus ledifolius and Symphoricarpos oreophilus, or within or immediately adjacent to clumps of Agropyron spicatum. A similar phenomenon has been reported by Greenlee and Callaway (1996) who found that Lesquerella carinata seedlings survived better under bunchgrass in a dry year, but survivorship was lower in plants associated with bunchgrass in a wet year. At higher elevations, where drought stress is lower, this species has been observed growing in open soil, usually away from larger plants (Lesica 1995). All known populations lie on the Pryor Mountain Wild Horse Range. The largest population is on steep, west-facing slopes that have been severely terraced by wild horses that produced parallel trails, 1-2 feet wide, every 3-6 feet of vertical distance. While the species was common above and below the trails, it did not occur on the trails, which were completely barren. Terracing of fragile steep slopes is common in this area of Pryor Mountain Wild Horse Range, and up to 20% of the habitat there has been lost to terracing (Lesica 1995). The wide trails are most likely caused by horses foraging for grass, although deer may also use these areas. Although Lesica's bladderpod is in no immediate danger of extirpation from the site, it appears that the presence of wild horses has had a negative impact on the populations (Lesica 1995). Greenlee, J. T. and R. M. Callaway. 1996. Abiotic stress and the relative importance of interference and facilitation in montane bunchgrass communities in western Montana. American Naturalist 148:386-396. Lesica, P. 1995. 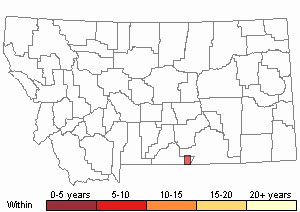 Conservation status of Lesquerella lesicii in Montana. Unpublished report to the U.S. Forest Service and the Bureau of Land Management. Montana Natural Heritage Program. 16 pp. plus appendices. Rollins, R.C. 1995. 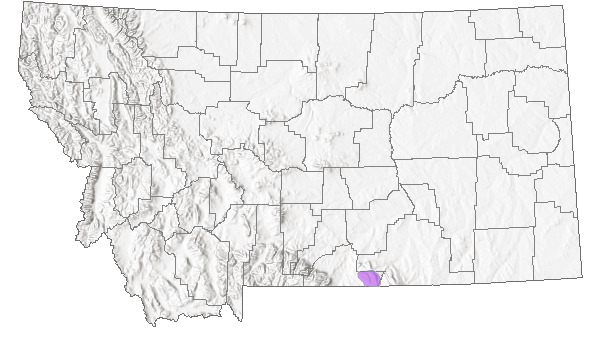 Two Lesquerellas (Cruciferae) of south central and western Montana. Novon 5(1): 71-75. 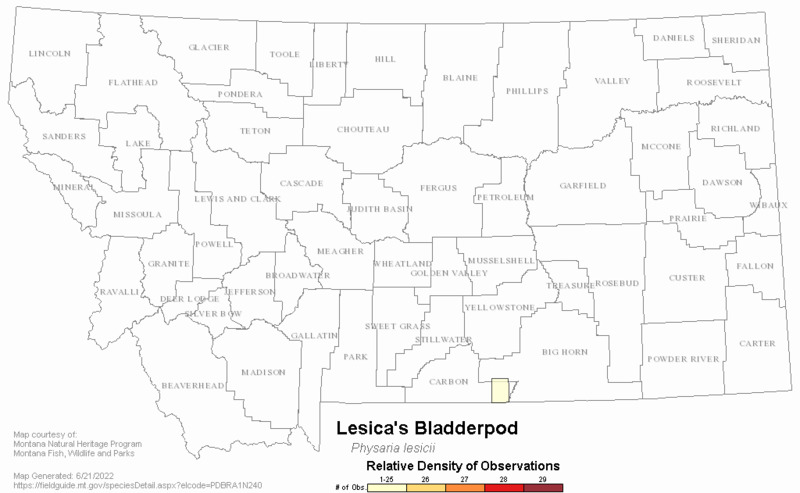 Web Search Engines for Articles on "Lesica's Bladderpod"